Our mountains and Foothills have inspired generations of Carolina-born and -bred folk musicians — who have, themselves, inspired generations of writers. 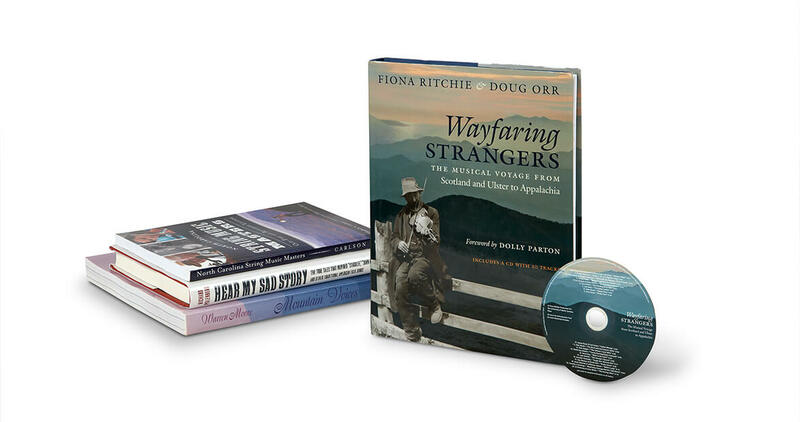 Four books tell the stories behind the musical storytellers. Polenberg has collected true stories of the characters that inspired well-known folk songs, and explores how they’ve been immortalized in music and lyrics. The stories of Randolph County’s Omie Wise, western North Carolina’s Frankie Silver and Tom Dooley, and Winston-Salem’s “Poor” Ellen Smith, among others, remind us of “our shared humanity” with the people who have become a constant in Southern folk song traditions. A North Carolina native, Moore interviews 180 farmers, carpenters, hunters, professors, musicians, and Native Americans whose daily lives are framed by the Southern Appalachian Mountains. In this oral history of people of “a generous spirit,” personal accounts from mountain natives are paired with images of their world, creating a portrait of people who believe in independence, strong work ethic, and honesty. Where did many of our favorite ballads and folk tunes originate? Ritchie and Orr follow the emigration of people, songs, and instruments from Scotland and Ireland to our Appalachian Mountains. They introduce us to ancient ballads with roots in a land far away, and tell of the songs’ transition into old-time, familiar favorites — some of which are represented on an included 20-track CD. Winston-Salem author Carlson pays tribute to our state’s old-time and bluegrass music, the musicians who pioneered it, and those who continue to keep it alive. Carlson focuses on Charlie Poole, Tommy Jarrell, Joe Thompson, Doc Watson, Earl Scruggs, David Holt, and Rhiannon Giddens, musicians who “embody the deep creativity and cultural encounters important to the evolution of the state’s music traditions.” To us, they’re storytellers. But Carlson’s in-depth coverage also tells us their stories, ballads in their own right that are worth preserving, too. If you like live music, summer is the season to hear singing, plucking, and strumming in nearly every corner of our state. This month alone, you’ll find world music in Waynesville, classical in Greensboro, and jazz in North Topsail Beach. Find out more about North Carolina music festivals in July and beyond at ourstate.com/2016-music-festival-roundup.